So, I went to my doctor's office yesterday - a walk-in - the same "charming" nurse practitioner from a few weeks back saw me. Still has that same sparkling personality. She basically told me I had a sinus infection that wasn't bacterial "...yet...", and suggested about $40 worth of over the counter remedies. I dutifully purchased them all and came home and started using them. By mid day, my ears started feeling clogged. When I woke up at 3AM, they really hurt, oh, and my vision was blurred. As it will be, when you develop PINK EYE overnight. So, I took a hot bath, tried to think calm, rational thoughts, and decided I was going to an Urgent Care other than my provider's office in the AM. So, I found one nearby that opened at 7AM, and I arrived at 7:03. Couldn't even finish my paperworl before they called me back to get my history. The doctor, an actual MD came in and took one look and said, "Well, you've been better!" He checked my left ear - the one that wasn't hurting. Infected. Then the right ear, that was hurting: really infected. There were words like bulging and pus that got thrown around. I'm the one on the right, times two. So, he had the nurse give me two shots - antibiotics and steroids. I refrained from the "pulling down my pants for a little prick" joke, but did assure the (male) nurse that I wore clean underwear just for him. Then he wrote me a scrip for the pink eye, one of the ear infections, and sent me on my way with an excuse note. OH! And when I told him I had to fly to California on Monday, he walked me through a regimen to do pre-flight to make it more comfortable. That's what happens when you LISTEN to your patient. Sheesh! Now, I have to say, I can see a small difference with just the shots. I'll go get the rest on my lunch break. I'm working from home the rest of the day, which works for my boss, and therefore also works for me. I'd post a picture, but ain't nobody got time for that. I look like hell, crusted over. 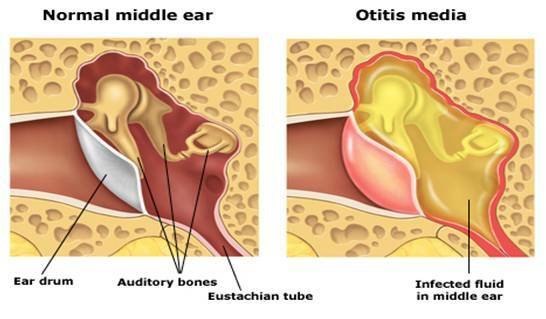 Do you have a perforated eardrum? How did you manage to get otitus media? I'll bet it all hurts.Conjunctivitis is bad enough.by tomorrow the ears may be better but your eyes will be crusted with pus as secondary bacterial infection takes hold and your injections won't help with it. Not trying to be funny, since I know the disease well and have had it many times. It's the ailment I fear most. Blogger ate my comment, but I'd wanted to say that the conjunctivitis will likely cause much more misery than the troublesome otitis media. Virulent viruses vilely give way to secondary bacterial infections with no treatment but to wait. Oh wait NOW my original comment is back.